The software defined, multiband-capable airborne transceivers of the R&S®M3AR family feature a modular design and state-of-the-art technology. This leads to high MTBF values and a long life. The R&S®M3AR family is the product of decades of experience, especially in the design and development of airborne radio equipment and software defined radio technology. The R&S®M3AR multiband, multimode, multirole radio is the solution of choice for the reliable transmission of mission-critical information, whether it's for jet or propeller aircraft, helicopters or unmanned aerial vehicles. Rohde & Schwarz satisfies the most demanding requirements of a multitude of airborne platforms. The R&S®M3AR transceivers are in operation around the world and feature high reliability even under extreme environmental conditions. The outstanding MTBF values ensure low maintenance effort and high availability. A variety of optional EPM (ECCM) methods are available. For instance, the R&S®SECOS frequency hopping method with integrated encryption can be installed in parallel with HAVE QUICK I/II. The R&S®M3AR family consists of the R&S®MR6000A in an ARINC 600 housing and the R&S®MR6000R/ R&S®MR6000L, both of which are ARC-164 form & fit compatible. The R&S®MR6000L is equipped with a local control panel while the R&S®MR6000R is remote-controlled. 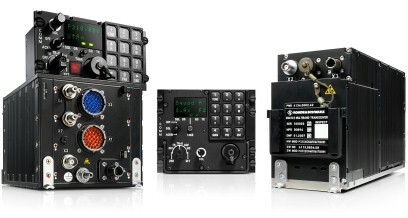 All R&S®M3AR radios can be remote-controlled via the MIL‑STD-1553B data bus, as well as by the R&S®GB6500 control unit. The R&S®MR6000R or R&S®MR6000L can serve as a form, fit and function (F3) replacement for legacy AN/ARC-164 radios. Despite its compact design, the R&S®M3AR radio family offers excellent RF characteristics, even under harsh environmental conditions. The R&S®M3AR transceivers are compatible with common military and civil communications standards. The receiver features excellent sensitivity, high crossmodulation immunity, selectivity and suppression of strong interference signals. The transmitter is optimized for low spurious emissions and the suppression of wideband noise. The R&S®M3AR family of transceivers covers all of these frequency ranges in AM and/or FM, depending on the application. The fast frequency hopping filter effectively reduces wideband noise during transmission. In receive mode, unwanted signals are suppressed by the filter, thus preventing negative effects such as crossmodulation, blocking or desensitization. The excellent co-site behavior permits the parallel use of multiple radio lines in a minimum of space, which is frequently the case with reconnaissance and transport aircraft. Electronic protective measures (EPM) protect radio links from electronic countermeasures (ECM) such as jamming. Frequency hopping is an EPM (ECCM) method that is available as an option in all R&S®M3AR radios. The NATO frequency hopping method HAVE QUICK I/II and the state-of-the-art SATURN method are integrated in the R&S®M3AR family in line with STANAG 4246 and STANAG 4372. These methods ensure a jam-free radio link. Rohde & Schwarz also developed the R&S®SECOS frequency hopping method, which provides reliable protection against active jamming even at high flight speeds. It can also encrypt voice and data transmissions up to 16 kbit/s. R&S®SECOS has been tried and tested around the world for many years. This method can be integrated in Rohde & Schwarz transceivers in parallel with HAVE QUICK I/II, thus providing the flexibility to participate in national and international missions. When using the R&S®SECOS or SATURN frequency hopping method, voice communications are compressed by means of a CVSD vocoder and then transmitted digitally. To protect radio links from tapping and spoofing, the information being transmitted can be encrypted. With the R&S®MR6000A from the R&S®M3AR family, Rohde & Schwarz was the first manufacturer to offer embedded NATO encryption. This eliminates the need for an additional external encryption device. The R&S®MR6000A therefore saves space, reduces weight and is easy to install in the aircraft. The R&S®MR6000A is interoperable with external crypto devices such as the KY57, KY58, KY99, KY100 and ELCRODAT 4-2. The powerful R&S®SECOS encryption method developed by Rohde & Schwarz is available for all transceivers in the R&S®M3AR family. All R&S®M3AR radios conform to STANAG 4204 and STANAG 4205 and can be connected to external encryption devices. This permits the use of state-of-the-art frequency hopping methods with legacy encryption devices, so that systems such as the KY58, which is widely used by NATO, can be combined with HAVE QUICK I/II for instance. The ELCRODAT 4-2 and the R&S®MMC3000 are external encryption devices that can be used with all R&S®M3AR radios for establishing secure radio links. Although lightweight and compact, R&S®M3AR transceivers deliver outstanding transmit power of up to 20 W in AM mode and up to 30 W in FM mode. This ensures quality communications links for aircraft operating near the ground, as well as between transmitters and receivers that are located far apart. During formation flying and for onground radio checks however, the transmit power can be stepped down in order to reduce self-generated electromagnetic radiation and as a result minimize susceptibility to reconnaissance. The operational parameters for R&S®SECOS, SATURN, HAVE QUICK I/II and encryption keys are loaded via a fill interface. The desired preset is selected via the MIL‑STD‑1553B data bus, for example. The R&S®M3AR radios contain two separate memory areas, each of which can hold 100 presets, so that a sufficient number of presets is available even for longer missions. Due to the preset concept, simply changing the preset number provides error-free switching between radio networks during flight, even in critical situations. Depending on how the transceiver is integrated in the aircraft (e.g. operation through a central unit via the MIL-STD-1553B data bus), the presets can be identified by intuitive, recognizable names such as "EDDM TWR" or "Squad A" that are shown on the display of the radio and remote control unit. For the navy for example, a Link 11 interface in line with STANAG 5511 was integrated in the R&S®MR6000A, as well as sonobuoy functionality and a guard receiver for monitoring channel 70 of the Global Maritime Distress Safety System (GMDSS), so that digital selective call (DSC) signals can be received. The tactical VHF range, including a 40.5 MHz guard receiver, was integrated in the entire R&S®M3AR product family for communications with ground troops. The high transmit power of up to 30 W in FM mode and the excellent receiver characteristics ensure reliable communications links even during very-low-level flights. The three types of built-in tests (PBIT, CBIT and IBIT) aid the user in checking the functionality of the device and determining if, and where appropriate, what type of errors exist. BIT results can be viewed on the display or polled via the MIL-STD-1553B data bus. The R&S®M3AR family of transceivers features a robust design and high-quality components. The result is high MTBF. The R&S®M3AR transceivers are tested in accordance with various military and civil standards such as MIL-STD-461, MIL-STD-810 and RTCA/DO-160. For instance, Rohde & Schwarz airborne transceivers can be operated in temperatures ranging from – 40 °C to +71 °C. To prevent damage, the devices automatically continue to operate at reduced power if overheating occurs. When the temperature normalizes, the device automatically returns to the original power level without manual intervention. All software components and updates can be loaded in the radio by an authorized service center using the R&S®ZS6000 radio loader. Modifications can be made or functionalities can be added without having to change the hardware. The current software status can be queried via the MIL-STD-1553B data bus. The R&S®M3AR family of transceivers features a modular design and is manufactured with SMD technology. The high quality and workmanship of the components that are used ensure a high MTBF and in general a long product life cycle. This minimizes the impact of discontinued components, reduces stockkeeping and streamlines logistics.